Keyhole correction of the acquired defects of the forefoot is a technique, which aims to overcome some of the problems posed by the numerous techniques developed over the years for this type of surgery. In realty, there is nothing revolutionary about this technique: the concept of provoking fractures in the bones of the foot to allow the bones to realign themselves according to a more rational “geometry” dates back many years. • no insertion of screws, wires or pins. This all means foot functions recover rapidly, as does psychological and physical wellbeing. The real PBS innovation lies in the abolition of the concept that every fracture must be immobilised in order to heal. After being realigned, the fractures made are left free, so that healing is the result of real load bearing needs and not according to pre-established standards. The PBS technique always enables surgery to be fully personalised, yet at the same time it fully complies with the guidelines of the laws of biomechanics and physiology of the foot. Every operation seeks the most suitable angle of fracture for each patient, which is anatomically and functionally efficient. Personalised bandaging following the operation is just as important as the surgery itself, and allows the physiological healing process to spontaneously restructure the foot and avoid any additional stress caused by arbitrary immobilisation. Surgical anaesthesia of the foot can be achieved using many techniques. Keyhole surgery is unusual as it requires the immediate mobility of the limb, and needs the patient to be pain-free after surgery, in order to achieve the ideal ankle block. The ankle block is a selective, local anaesthesia, which only suppresses the sensation of pain (whereas sensitivity to touch, for example remains unaltered). Together with a tranquilliser, administered before carrying out the block, makes it acceptable to most the patients. The foot is washed using a sterile solution and antimicrobial disinfection is carried out. Small, surgical, dental burrs are used to correct the deformity and modify the bones of the forefoot. These are inserted through small, approximately 2-3-millimetre incisions in the skin. The surgeon guides the burr using a special radiological device to help him “see” the bones and the burrs. The most important innovation of the technique is that it does not use fixative devices (screws or wires). This allows the fractures to heal according to the “needs” of the foot, a foot which will be able to walk immediately after surgery. After surgery, the foot is bandaged and taped using a technique specifically developed by the medical team. You should not remove or change this bandaging before your first post-op check-up. Immediately after this initial stage, you should place your foot on the floor and make it bear your weight as normal to achieve the correct physiological readjustment immediately. The surgical treatment can also be carried out in our Day Hospital, as the patient does not have to be hospitalised. On the same day as surgery, you will be given post-surgical footwear and padded bandaging, so you can place your feet on the ground and walk normally without using crutches. The medical team selects and personalises its PBS instruments, and continually improves quality and technological innovations. 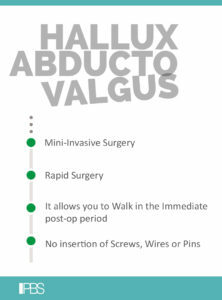 Surgery is just one of the steps, in the PBS Procedure to treat Hallux Valgus. It is always preceded by an initial consultation, during which the doctor evaluates whether or not to proceed with non-surgical therapies. Surgery is followed by the first check-up, after approximately15/20 days, during which the medication is changed, the bandaging is reduced and the post-surgical shoe is replaced by a suitable, more normal shoe, which should be comfortable (e.g. a sports shoe and 1 or 2 sizes too big). Several check-ups may follow, depending on the extent of the condition treated, and after 45 days the orthostatic load Is checked by X-ray. This surgical technique requires a thorough knowledge of the functional dynamics of the foot and of its anatomy, and special experience and ability to deal with load problems. As it is a surgical operation, it should be limited exclusively to the deformities of the foot, which cause pain and difficulty in walking, only once the possibilities and the limits surgery, regardless of the technique used have been discussed with the patient.